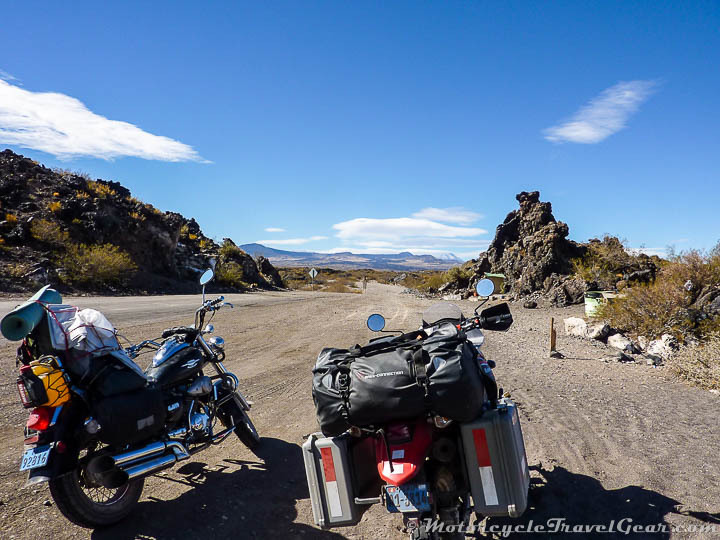 Chapter 17: April 17th, Las Lajas, Argentina. The last time I had ventured on a long unpaved road was in Oxapampa, one year before. Back then, it had been about 20km of uneven paths full of loose rocks and holes. 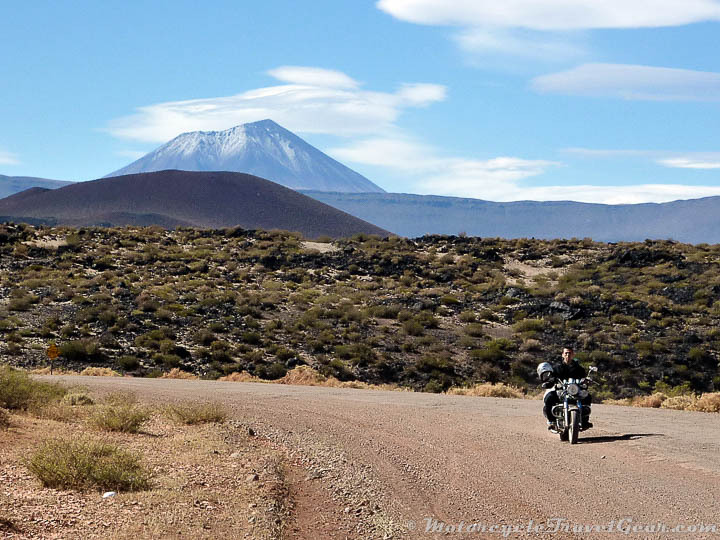 It served as great learning experience because this time, Fernando and I were barreling down the Ruta 40. It was all very lovely riding until we ran out of asphalt. 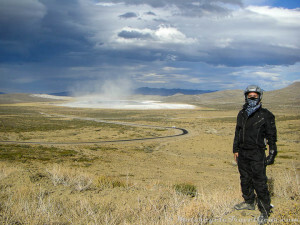 We stopped to take a deep breath before crossing into the dirt. Once we started riding on the unpaved section we realized it wasn’t that bad. There were grooves on the road that had been left behind from trucks that traced a relatively safe path to traverse. The only real inconvenience was all the dust that they kicked up in their wake. Well, that wasn’t really the ONLY inconvenience. 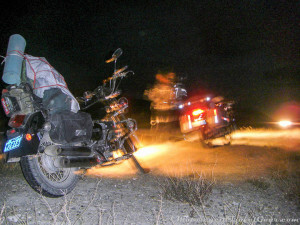 It’s possible that an even bigger problem was the rattling that the bike was enduring. It felt like it was falling apart. Halfway through the day’s ride I had to stop to put on the thicker gloves. It had been fairly warm when we left Malargue that morning so I was using the motocross gloves that my uncle had given me in Santiago. The temperature drop was noticeable so it was time for the big leather gloves. I strapped the lighter ones to the backpack behind me and kept going. The landscape was incredible. 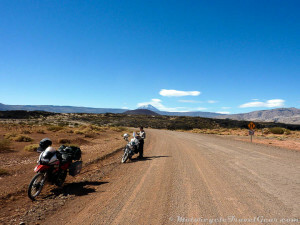 We had endless clear blue skies and multicolored hills to our right that led to the Andes in the distance. Save for the occasional truck overtaking us on the road, we had the whole place to ourselves to ride as we pleased. When we finally reached another stretch of asphalt, we stopped to shake off the dirt. The sun was starting to beat down again so it seemed like a good idea to switch back to the lighter gloves. The problem was that they weren’t there anymore. They had fallen off who knows how far back and I wasn’t about to backtrack a couple hundred kilometers on the unpaved roads to look for them. Since misery loves company, the glove thing wasn’t the only issue. Now, every time I hit a bump on the road I heard some part of the motorcycle hitting a metallic surface. I was getting flashbacks once again of the clinking noises I heard just before breaking down in Chile. I got off and checked all over the bike but I couldn’t find the source of the noise. 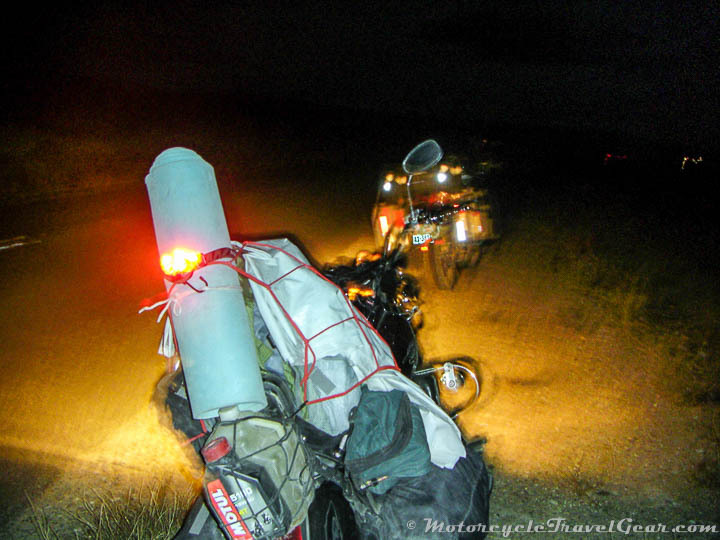 I assumed it was the tools in the saddlebag that had come loose but deep down, I knew that wasn’t the case. A while later we made a stop in Buta Ranquil, a small roadside town, to find some gas and food. 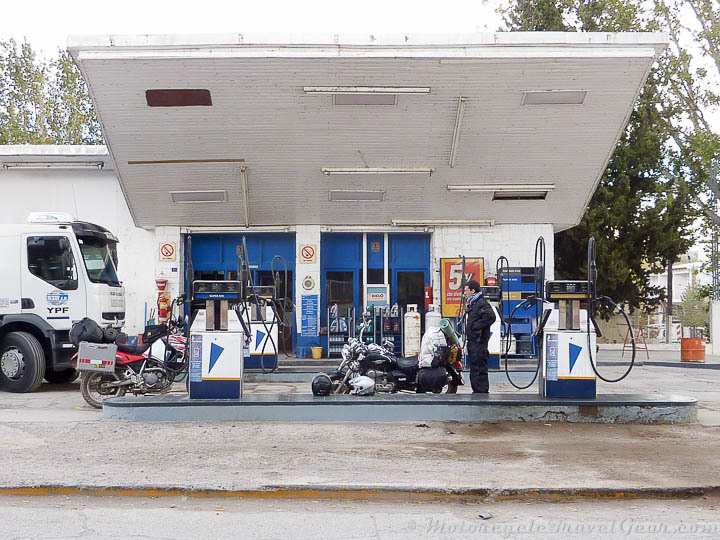 It seems that it doesn’t get many visitors because the attendant at the gas station, Moncho Vasquez, became instantly fascinated with our odyssey. He treated us to a glass of wine, something he seemed to know a lot about. We only had half a glass for obvious reasons. 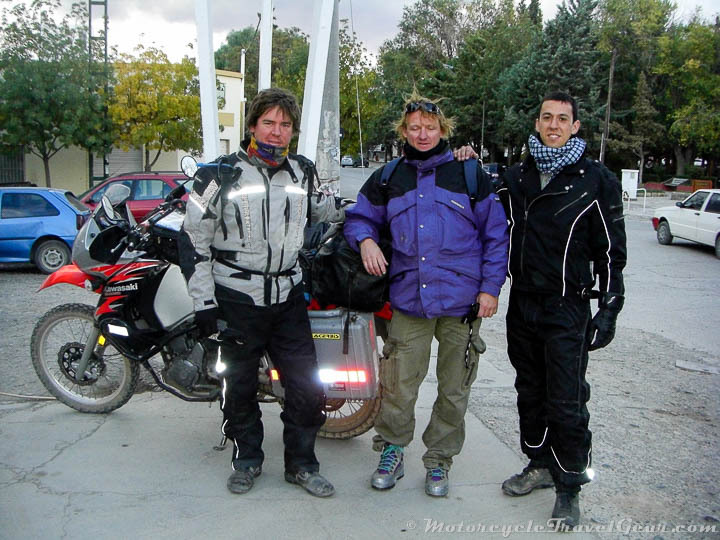 Before departing, he kindly offered us his house in the nearby town of Chos Malal to spend the night. We thanked him for the gesture and told him we’d take him up on the offer if we decided to spend the night in Chos Malal. We would have to make a stop there anyway to get more gas. When we got to Chos Malal we faced a situation that I had never even considered. Both of the gas stations in town had run out of gasoline. I realize that gas stations need to be supplied with fuel regularly. They don’t just extract it from where they’re built, but in the same way you don’t think about your supermarket running out of food, I hadn’t considered a gas station running out of gas. It’s something that’s just always there. The YPF fuel truck had just rolled in and was pumping fuel into the station’s underground wells. There were four or five cars waiting in line but when we walked up to ask how long the wait would be, the attendants told us to pull our bikes up to the front of the queue. They figured we’d fuel up quickly and didn’t want us waiting in the cold. While we were waiting, another rider pulled up to the station. This was a guy who had done the Ruta 40 Challenge four times and was now on his fifth. He had even done it on a tiny 50cc bike once. He was heading north while we were heading south. His advice to us was to be careful with the winds and the cold. We ended up having a nice and lengthy conversation since the supply truck took over two hours to fill the wells. Evidence of this delay was in the extremely long line of cars that now completely wrapped the block and started going up another street. When we finally left, the line was four blocks long. There was still enough daylight for us to reach Las Lajas, our intended destination for that night. I sent Moncho a message thanking him once again for offering us his home but that we’d continue our trajectory in order to save us a few kilometers worth of riding for the following day. The winds past Chos Malal were much stronger than anything I had been subjected to up to that point. It was much worse than the sandy gusts in Southern Peru. The sun checked out earlier than we expected and we were forced to take it slower and be more cautious. The wind kept pushing us into the opposite lane. When we lost the twilight I was amazed by the amount of stars that were clearly visible. It was as though the clouds had completely disappeared as soon as night fell. This is when I learned a valuable survival technique that I now share with you. When driving at night, don’t look at the stars instead of the road. I almost ran into Fernando, who was riding in front of me, because I was distracted by the bright twinkles in the sky. Despite this near incident, I couldn’t help looking up at least a couple more times, but I was also paying close attention in case any animal should wander onto the highway. We had been warned to no end about goats, cows, and horses that wander onto the road. A fellow rider on a BMW had hit a goat head-on not too long ago. He wasn’t hurt but the goat didn’t have the same luck. He had to peel off chunks of meat off his fairings and engine. The darker it got, the more I realized that something was very wrong with the bike. Besides the intermittent rattling noise, I had a very strong feeling that the cars behind me couldn’t see me at all. I was right. My tail light had burned out and only lit up when I used the brakes. I obviously couldn’t ride the rest of the way with the brakes on so it was once again time to be creative. Before leaving Lima, my girlfriend had given me her head lamp. It had three modes on it: low, high, and red beam. At the time, I didn’t know what the purpose of having a red function on a flashlight was (I’ve since learned that it’s to preserve night vision) but it was all of a sudden a godsend. I pulled out the little head lamp and strapped it to the back of the bike. Hopefully, this would lower my chances of getting rear-ended at night. We didn’t have to put up with the wind and the cold much longer. We reached Las Lajas and immediately started looking for a place to spend the night, but as luck would have it, all the guesthouses and hostels in town were packed. Every. Single. One. There was a big motocross championship taking place the next day and people had come in from all over to participate or see. We resigned ourselves to setting up our tents at a local campground near the town’s entrance. I was actually happy about it. It had been a while since I’d used the tent and the site looked like a great place to camp. The bathrooms were spotless and the whole place was very clean. The weather was kind to us while we were setting up but when we turned in for the night the wind started to howl like a banshee. 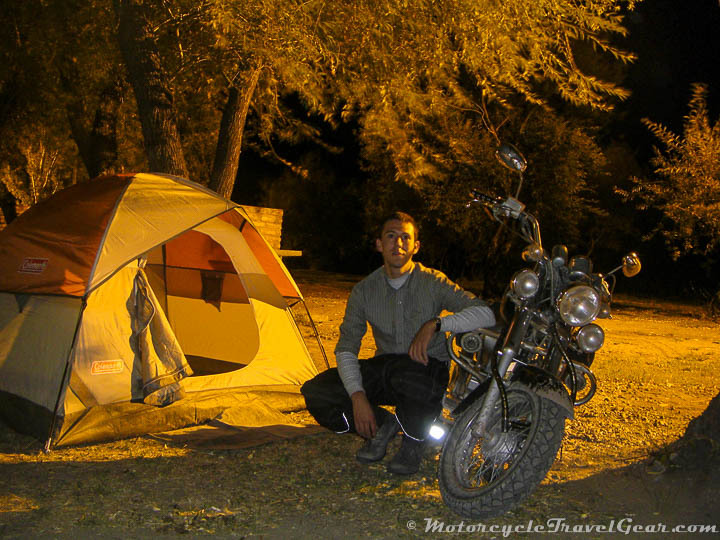 I thought the whole tent might be ripped from the ground and that the motorcycle would end up on the floor. I shut my eyes and put in some earplugs to try to tune out the noise and get some sleep.